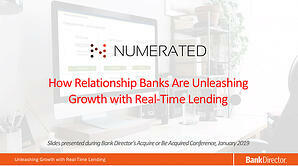 Real-time lending provides a winning strategy that unlocks bank growth. Successful fintech partnerships are now helping banks unlock the growth necessary to out-compete the largest national financial institutions in their markets. This is notably true for the business segment, where real-time lending has emerged as a powerful strategic engine of growth that combines the power of digital with relationship banking. Numerated CEO Dan O'Malley presented a workshop session at Acquire or Be Acquired to help financial institutions build a winning real-time lending strategy. Download the workshop session presentation slides to learn more.